Just for kicks, I've created a little Google map that shows the airports where I've flown and landed. So. In order to make myself get back in the air, I decided that today would be the day I flew the "VFR Corridor" between the Washington and Baltimore airspaces to get to the Chesapeake Bay. The corridor.... It's four miles wide in its narrowest stretch. At the speeds we fly, it would take about two minutes to fly from one side to the other, half that time if we were flying down the middle and veered sharply to the right or left. To the right (the South side) is the Flight Restricted Zone, or FRZ, pronounced "Freeze." If you fly into the FRZ, you're in BIG trouble, and can expect meeting with Secret Service while face-down on the ground, perhaps an "intercept" by an F-16 or Blackhawk helicopter, and so on. 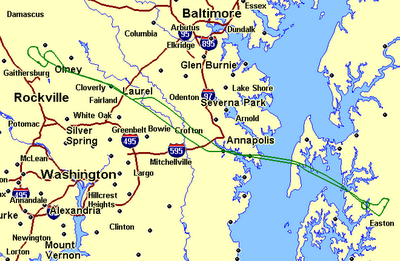 To the left (the North side) is the Baltimore "Class B" airspace, in which large planes (i.e., 737s) are descending to land at Baltimore-Washington International Airport (BWI). If you stray into the Class B airspace without permission, the FAA can "take action" against your hard-earned pilot certificate. Other than the corridor, though, the only other options if you want to get from Gaithersburg to anywhere East of Washington is to either seek and get permission to fly through the Class B airspace around BWI, or go North and all the way around Baltimore. But, Air Traffic Control is not guaranteed to give you permission to fly through the controlled airspace. And one of the whole points of flying is to go in a straight line rather than following the seeming vagaries of roads, so going all the way around Baltimore seems like a waste of time. So, with certain limited exceptions, all the airplanes that want to get from one side of the Baltimore-Washington line to the other have to use this corridor, which can make it somewhat congested. There are different altitudes that East-bound and West-bound pilots are supposed to use, but a lot of pilots seem to not even know about the published altitudes, much less pay attention to them. It's not an enforceable rule, so there's the possibility of coming in close proximity with an airplane heading the other way. 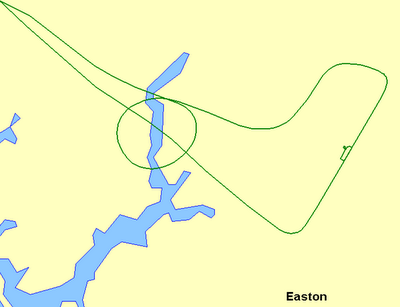 In the snippet from a navigation chart, above, the Gaithersburg airport is the little magenta circle in the top left corner. The blue on the right is the Chesapeake Bay. 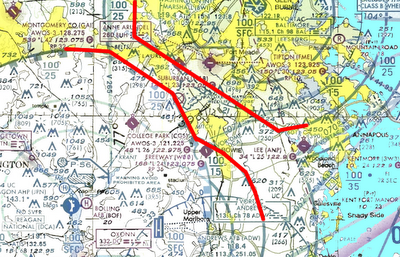 The red line on the bottom is the boundary of the FRZ, and the red line on the top is the boundary of the Class B airspace. You can see the challenge -- get from Gaithersburg, through the narrow corridor to the other side without straying into forbidden airspace. And remember, in the air, the boundaries are NOT there for you to see -- they're invisible lines in the air. 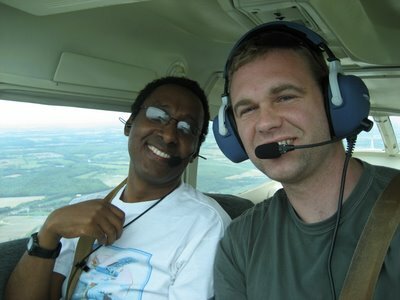 Since I decided early on in my flight training to always err on the side of caution, I had thought that the first time I went through the corridor as a pilot, I would take an instructor with me. But scheduling an instructor's time on top of scheduling a plane and finding time away from work, well, it was just too complicated to get a flight scheduled. So I reevaluated and decided a week or two ago that I was just going to have some faith in my abilities, prepare thoroughly, and do it. I studied the procedures and maps, I looked at waypoints that could be programmed into the GPS, and I decided to go. I had learned everything I needed to know to do it safely: it just requires good, meticulous flying. On the way to the airport this morning, though, I thought of my friend, Gashaw. 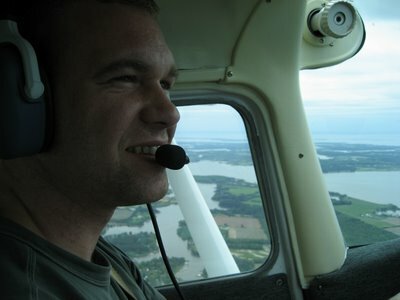 Gashaw is an instrument-rated pilot with a lot of experience compared to me, more than 280 hours. So I called him up as I headed to the airport and asked if he'd like to go flying. "Sure," he said. So he met me at the airport and we took off. We had a great time. On the way out, Gashaw offered to show me how to ask for a "Class B Transition" from Air Traffic Control. If ATC granted our wish, we could fly on the North side of the corridor, away from the congested center of the corridor. I had never asked for a Class B transition, so while I flew the plane, Gashaw called ATC on the radio and requested the transition. The first controller said we needed to talk to a different controller, so we changed frequencies. The second controller agreed to let us into the Class B airspace, and instructed us to fly a certain heading. This allowed us to climb higher, above the other traffic using the corridor and North of it. In the GPS printout above, you can see where the green line veers straight East, then Southeast and parallel to the corridor. That was the route we were given and allowed to use with ATC's permission. After a little while we were past the corridor and the magnificent Chesapeake Bay opened up in front of us. We were having a lot of fun. 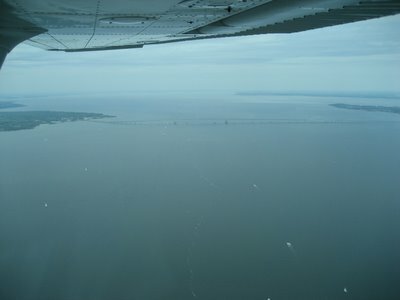 We crossed the bay, and headed for an airport in Easton, Maryland. When we arrived, I was going to fly over the field about 1,000 feet above the traffic pattern altitude, but realized that would put me on the wrong side of the runway for the proper traffic pattern. So I put the plane in a spiraling descent (the circle below), then entered the traffic pattern and landed. We parked the plane and I spoke to the "lineman" to have it refueled, then we went into the Hangar Cafe for some breakfast. We were disappointed -- it was 11:31 when we sat down, and the waitress told us that breakfast ended at 11:30. We had to settle for hamburgers named after various airplanes. Gashaw had the "Cessna Burger," with bacon and cheddar cheese. I had the "Mooney Burger," with mushrooms and Swiss cheese. The food was good, but I had REALLY been looking forward to breakfast. We lingered for an hour, eating and talking, then paid for the fuel and took off again to head back to Gaithersburg. 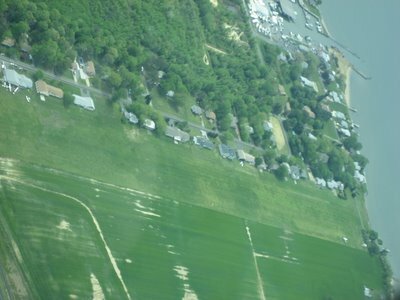 On our way, we flew over Kentmorr, a small grass airfield right on the edge of the Chesapeake Bay. This is one of the airports that Jodie is looking forward to visiting when she starts flying with me. 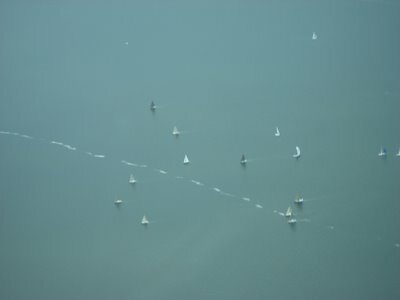 As we crossed the bay, we watched all the "little" sailboats enjoying the beautiful day on the water. As we headed back into the corridor, I decided to fly the center of the corridor and not ask ATC for a Class B transition. The published altitude for flying the corridor towards Gaithersburg is 1,500', so I descended, turned on my landing light to increase our visibility to any airplane flying toward us, and kept the plane centered smack dab in the middle of the corridor all the way through. So that was it. I flew the corridor, and it was fine, fun, and just as beautiful as I anticipated flying over the Bay. With Gashaw's company and advice, it wasn't nerve wracking at all, and I look forward to doing it again. I will say, though, that having the GPS in the plane was very reassuring, and I'm not sure that I would ever fly through the corridor without the GPS. I've heard more experienced pilots say the same thing, though I've also heard older pilots scoff at the idea that a GPS is "needed" for anything. But the airspace and rules affecting and restricting it have changed a LOT in the last five or six years. In fact, the FRZ didn't even exist until after 9/11. The Feds now see small, wandering planes as much more of a threat than they used to (though with little reason), and the consequences of not being precise in your navigation can carry much greater consequences for minor deviations in course. Given all of that, I think I'll simply set the use of a GPS in the corridor as one of my "personal minimums" and consider myself prudent.